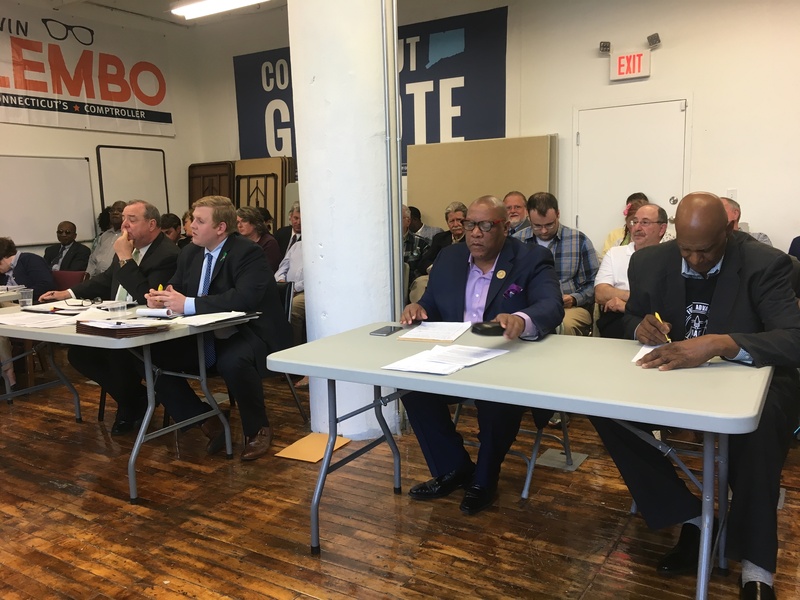 From left, Waterbury Mayor Neil O’Leary, Mack Demac, Connecticut NAACP President Scott X Esdaile, and James Monroe at the Thursday hearing. The chaotic ending of a Democratic congressional nominating convention last month was intensely dissected Thursday night in a special hearing as delegates and advocates contested the significance of unsigned paperwork and other irregularities. 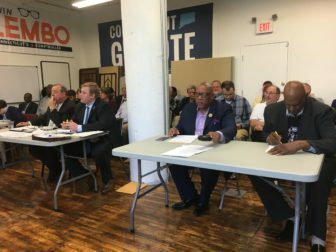 Waterbury Mayor Neil O’Leary and Scott X. Esdaile, president of the Connecticut NAACP, argued in a nearly three-hour, often heated hearing before a dispute-resolution committee that there were numerous flaws and mistakes made at the convention. 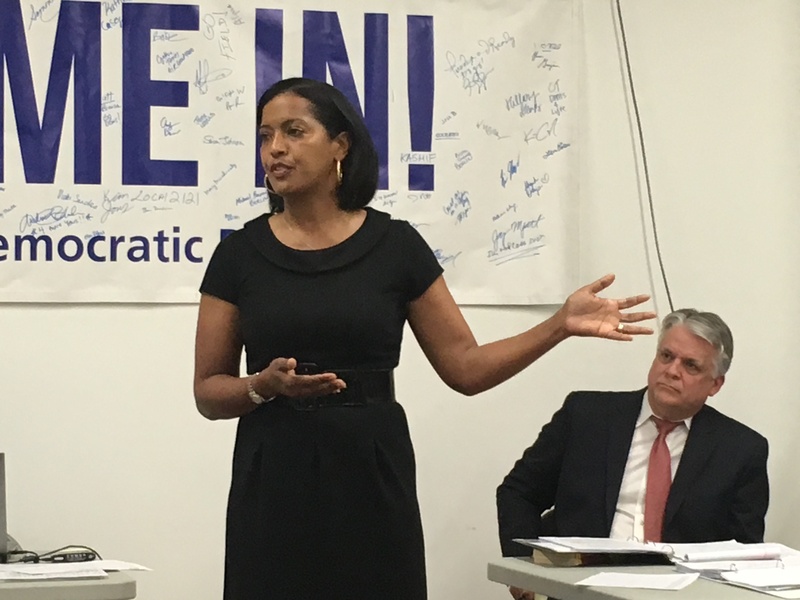 The hearing explored how Mary Glassman, a Democrat running for Rep. Elizabeth Esty’s seat in the 5th Congressional District, clinched the party’s nomination and narrowly defeated political newcomer and star teacher Jahana Hayes, who is trying to become the state party’s first African-American member of Congress. Glassman’s dramatic victory came after Hayes briefly held the 171 minimum necessary votes to win. Hayes lost that lead when the chairman of the New Britain delegation, Bill Shortell, announced three vote switches in his delegation. State party officials were informed Shortell’s paperwork only recorded one switch after the convention ended. 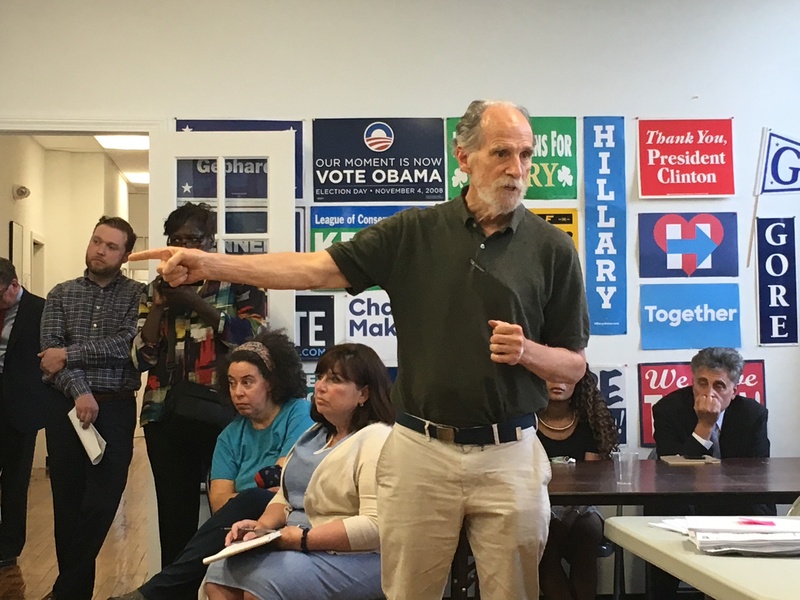 O’Leary and Waterbury delegate James Monroe each lodged a complaint with the Democratic Party and requested a hearing after the convention to address unsigned vote switching, the first ballot’s disparate votes cast to the number of credentialed delegates registered, and the amount of time left open for the second ballot. Hayes, who sat in the back during the hearing, told the panel she came to listen, learn, and understand thoroughly. Jahana Hayes addresses the panel at the Thursday hearing. O’Leary said the convention was disorderly from the start and that Tom McDonough, the convention chair, reminded delegates about the chance to switch votes after the second ballot for a period of nearly 40 minutes. McDonough said vote switching is an integral and decisive part of the convention process, and he was reminding people they needed to approach the microphone to do so. McDonough said he saw the candidates and others trying to get delegates to change their votes, and was simply allowing that process to take place. Audrey Blondin, the secretary from the convention, said the time for vote switches only lasted for 10 to 15 minutes and the implication of a 40-minute period is inaccurate. But O’Leary repeatedly said it lasted that long. The practice of vote switching is allowed by the rules and is common to Democratic and Republican conventions in Connecticut. But there is a separate form for vote switches, and any delegate who changes must sign, identifying the new choice. New Britain delegation chairman Bill Shortell gives his testimony at the Thursday hearing. Shortell said after he announced two other New Britain delegate switches he asked for the vote switching paperwork but didn’t receive it, and then later forgot to get it for them to sign. Robert DeCrescenzo, a lawyer representing Glassman’s campaign, said the testimony at the hearing verified the convention count reflects the will of the New Britain delegation. Darnell D. Crosland, counsel for the state NAACP, said the system is built around a paper trail, not the recollection of participants. “The process requires signed forms, and that’s all we are asking for,” Crosland said. 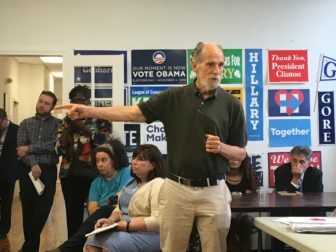 Christina Polizzi, the communication director for Connecticut Democrats, said the five-person panel of state central committee members has five days to make a written decision on the dispute.